Photo taken in 1930. Antonietta Adamo (9) and another student, Joseph Zengali (10), are taught the notes from the chart. Giuseppe had earned the title of Professor of Music -- note the diplomas in the background and his many competition medals. His medals included a gold medal issued by the Italian Government for "Marcia- Il Presidente" ("The President's March") which he had written in honor of the American presidency. A diploma for "Marcia- Il Presidente" is also on the wall. Giuseppe Adamo was born on November 27, 1889 in the small town of San Mango d'Aquino, Italy. His family was extremely poor and lived in the lower end of town. His childhood was one of extreme hardship. In October 1902 when he was nearing his 13th birthday, he managed to come to the USA. Like many immigrants he was processed at Ellis Island, New York. He then went to live with relatives in Scranton, Pennsylvania and got a job working in the coal mines. Many people from San Mango had immigrated to that area of Pennsylvania and found work in the mines. During this time, Giuseppe taught himself to read and write. At some unknown time, he went back to Italy. At the end of the war, he was released and sent back to the Italian Army. In December, 1918, while on furlough, he returned to his town and married Carolina Bonacci (b.1893 d.1971). He had to continue his military service and was soon back with his Army unit. In his absence, their first child, Maria, was born on September 8, 1919 (d.1988). His military obligations ended in 1920 and he returned home for a short time. Shortly thereafter, he set off for the USA. Again in his absence, another child, Antonietta was born on March 19, 1921. On this trip to the USA, he went to Cleveland, Ohio. He soon started fulfilling a lifelong dream to study music. He began studying music with a private music teacher. He learned how to play many instruments - violin, mandolin, clarinet, saxophone, flute, accordion, piano, trumpet… He acquired a job as a night watchman with RKO - MGM in Cleveland. The photo at the top right was taken in January or February, 1930. Antonietta Adamo (9) and another student, Joseph Zengali (10), are taught the notes from the chart -- ranging from whole notes to 64ths. Giuseppe had earned the title of Professor of Music -- note the diplomas in the background and his many competition medals. His medals included a gold medal issued by the Italian Government for "Marcia- Il Presidente" ("The President's March") which he had written in honor of the American presidency. A diploma for "Marcia- Il Presidente" is also on the wall. In 1928, he became a naturalized US citizen and had also sent for his family. He was still taking private music lessons but he had now begun teaching and writing music as well. He taught music all day and worked nights as a watchman at the MGM - RKO Building on Payne Avenue in Cleveland, Ohio. He had an additional job as the elevator operator at the same company. He slept about 5 hours a night. He was very proud of his children and would showcase their talent whenever possible. 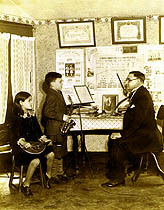 His daughters, Antonietta and Maria, often played music to entertain VIPs for RKO - MGM. After their performances the children were sent home by taxicab, while Giuseppe stayed behind to finish his shift. The children were regularly featured in live broadcasts on local radio stations. His hard work and careful control of his earnings enabled him to accumulate a very sizeable amount of savings, which allowed the family to live in relative comfort. They played publicly from January 1928 to 1933. 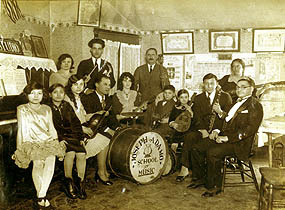 Seated (from left to right): Lucy Zengali, Maria Adamo, Mary Santeli, unkown man, unknown woman, Joseph Zengali, Antonietta Adamo, unknown clarinetist, Professor Giuseppe Adamo. Taken in their living room studio, in Cleveland Ohio, at the 14th St. family house -- 1930. The picture on the left is a group photo of some of the students (Jan or Feb, 1930). These were children and adults from the neighborhood. 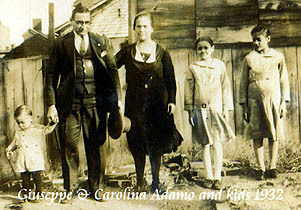 The photo below was taken in 1932 in the backyard of the 14th St. family home in Cleveland Ohio. From left to right: Nicola Amedeo (2 years old), Giuseppe, Carolina, Antonietta (11) and Maria (13). In 1933 he lost his job. Carolina desperately missed Italy and wanted to return, so in 1933 the family moved back to San Mango d'Aquino. When they went back they performed in small towns. From 1933 to early 1935 the children played twice a week at a hall behind the town church. Giuseppe's wealth allowed him to purchase a very large comfortable house and a great deal of land. He also joined a musicians' guild and became a very well-known music professor. This photo was taken in 1932, in the backyard of the 14th St. family home in Cleveland Ohio. From left to right: Nicola Amedeo (2 years old), Giuseppe, Carolina, Antonietta (11) and Maria (13). Many years later (c1955), in recognition of his contributions to music and his significant number of published pieces, he received the title of Cavaliere (Knight) from his guild in Italy -- Ordine dei Cavalieri della Concordia. An ambitious man who loved music. © 2000 Formula G International All materials in this site are protected by copyright.